Studio 5380: You're The Man! Welcome and happy Monday to you! I hope you all had a wonderful, refreshing weekend and are ready to start another week. After our busy week with VBS and grandchildren, it was nice to have a quiet, relaxing weekend. I got in a bit of crafting, a little reading and lot of just being lazy...it was great! Make a card using an outdoor theme: hunting, fishing, hiking, etc. Remember that your project must have at least one Cricut cut on it. While my hubby may not get a trophy for any sort of outdoor sports, he definitely deserves one for being an awesome Husband, Dad and Grandfather! So, let me tell you how I put this together. * Ribbon shaped card - "Something To Celebrate" Cricut cartridge. (I am really loving this cartridge!) This cut is made using the "Card Feature" found on page 47 and is cut at 5.25 inches. I love all the great layers on this image and they layer together wonderfully! * The stars stamped around the center are from CTMH stamp set "You Are"
* Trophy cut is from "Something To Celebrate". I used the shape on page 46 and cut it at 7.5 inches. The cut has a smiley face in the center of the trophy that I chose not to use. * I used the embossing folder "Woodgrain" from Paper Studio for the base of my trophy. 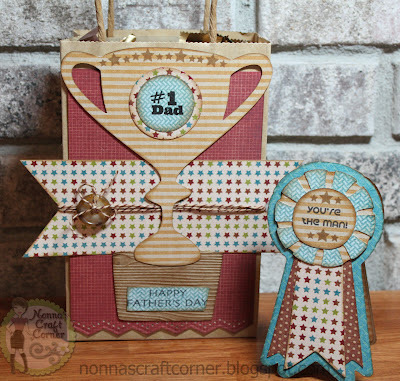 The stamp is from "My Pink Stamper"
* I added some stars along the top of the trophy using the CTMH stamp set "You Are"
* I replaced the smiley face with a couple of punched circles stamped with #1 Dad. This sentiment is from the K. Andrews "Guy Talk" stamp set. * The gift bag is stuffed with "Turtles" (the chocolate kind, not the little green guys), one of my hubby's favorites! So, don't you think this would be a great trophy for any Dad...outdoorsman or not? I hope you will stop by FCCB and see what the other designers have in store for you. I think they played along with the rules much better than I did! After you check out all that inspiration...go...get creative...then link up your Father's Day creation with us. I can't wait to see what you create! This project is so awesome Tanya!!! I love the look of that amazing trophy especially the embossing:) The ribbon is turned out fantastic too and did I see "turtles"...yummy! GREAT job! I'm so glad you had some time for yourself this weekend - including time to be lazy!! It's important to take time to relax. Your projects are fabulous! The papers are fantastic and I especially like the way the border on the bag compliments the bottom of the card. I love your projects this week--awesome job! Great looking projects! Love those Cricut cuts papers and your perfect details! Thanks for sharing with us at My Sheri Crafts! Great idea. I love both, the trophy and the ribbon. You are so blessed to have a great husband who is also a great father and grandfather...and he is blessed to have such a sweet wife! Super great trophy and card. The paper choices are wonderful. Thanks for joining MSC. Great project! And I follow your logic completely-of coure you need a tropy to complete any outdoors competition! thanks for joining us at My Sheri Crafts! 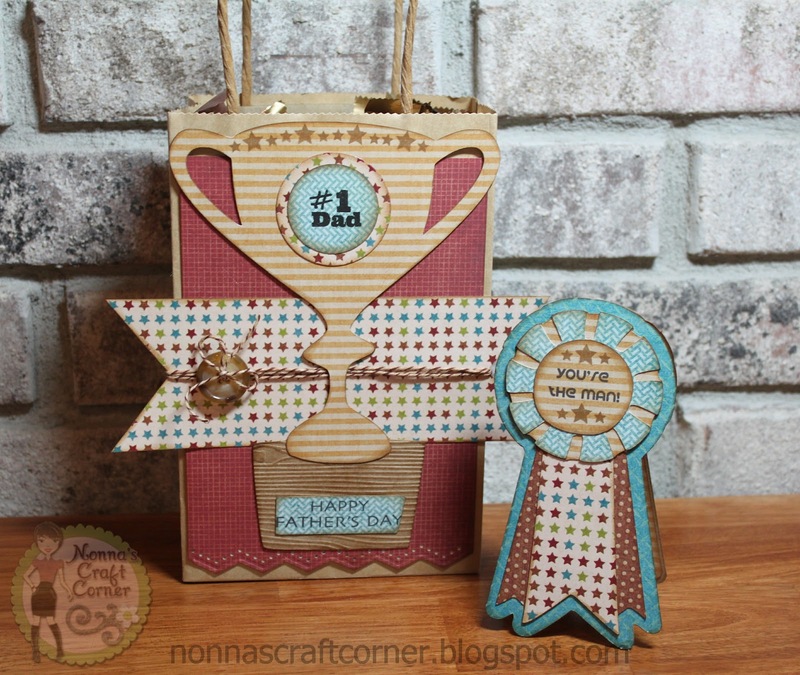 Tanya: Perfect entry into our Challenge #15 - "Happy Father's Day [or for a Male]" Challenge. I had loads of fun visiting, commenting and looking around on your blog. A heartfelt thank you for joining in at Simply Create Too. Amazing! Your details are perfect! I love it! These are incredible Tanya! Look at all those details! Amazing!! !